Glutamate is a natural amino acid found in foods containing protein, like milk, mushrooms and fish. Monosodium glutamate (MSG), manufactured with only the sodium salt of glutamate, is designed to be a flavor enhancer and is found in many foods. However, clever labeling practices and deceptions serve to camouflage its presence. Consider the claim “no added MSG.” This claim means that there was no MSG poured into the product—even if it was processed into the product. This is the practice of the glutamate industry and the food producers who use MSG. Why Do This? It’s simple: it keeps the money coming in and they don’t have to change their formula. Since the introduction, in the past 30 years, the incidence of Type II Diabetes has doubled. Obesity in children has skyrocketed! MSG is injected into lab animals to induce obesity so that pharmaceutical companies can test their drugs. The glutamate industry is fully aware of the harmful effects of MSG, that it is a toxic substance. They know that ingesting their toxin can cause diabetes, adrenal gland malfunction, seizures, high blood pressure, excessive weight gain, stroke and other health problems. If you eat MSG and experience any of these conditions, then you need to immediately eliminate MSG from your diet. Carefully read product labels at the market. Whenever you see it, avoid the products with MSG in their ingredients. 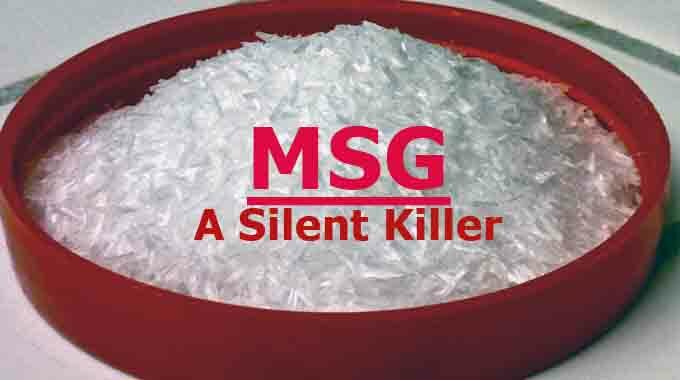 At restaurants, ask if they serve dishes containing MSG. Avoid fast foods. Most use MSG in their fries and drinks to enhance the flavor and to get you addicted to their foods. Consuming MSG causes swelling of the mucus membranes in the gastrointestinal tract. Cleanse your colon regularly to prevent this swelling.